Anyone want to guess as to the numbers? Your numbers sould about right. Post up the dyno sheet when you get it. What type of dyno? Mustang, dynojet? Tomorrow? I thought you were coming up here tomorrow? He never made it to the dyno. He did make it to my place. Too bad it was in the bimmer not the dime. I did run it on the dyno today. I won't post the numbers yet though b/c it's running like $hit at high rpm's. We figured out it is running really rich and fouling the plugs causing the ignition to drop off at higher rpm's. The guys said I will get an extra 25-30hp easy when the jets are right. I need to get new jets for the 44's. 2-3 sizes smaller. I love your car ... he is fantastic! 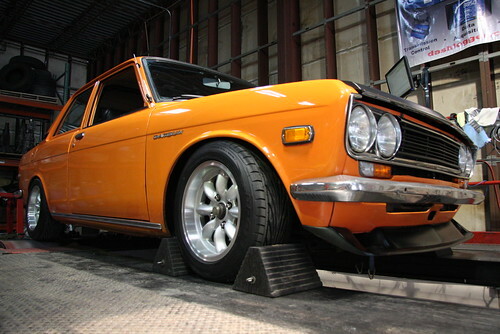 I noticed that you have a Datsun 510 Rc, here in Portugal is not for sale, Rc 510 that is very expensive there? Greetings and more photos of your machine! Yeah there are a few threads on the RC car here as well by other members. It is made by HPI and is available most places for $200 US. Have you looked on eBay? five&dime wrote: Yeah there are a few threads on the RC car here as well by other members. It is made by HPI and is available most places for $200 US. Have you looked on eBay? I tried and not found on Ebay ... you can give me a seller on ebay? Keep us updated on the HP numbers. I think you can make at about 150 hp. I have pretty much the same motor as you and I last dynoed 139 whp but I tuned it some by the sotp and I am strongly feeling I am making around 150 whp. it really goes. what jets do you have in there now? I am thinking 150RWHP as well. Cannot wait to drive it at that power!!! I've got to hand it to you, five&dime. This 1st Project Post thread of yours has gone on for quite some time now and you've had quite a string of luck with it. I've been a major fan up to this point. However, it appears you really dropped the ball and, frankly, I'm terribly upset. Not sure how to word this, but... why is your little Hotwheels Datsun 510 not sitting on the hood of your HPI cup car in that photo?!? Just joshing you. Keep up the insane work. Snoop Dogg knows a fine Dime when he sees one. SpudWhitman wrote: I've got to hand it to you, five&dime. it appears you really dropped the ball and, frankly, I'm terribly upset. 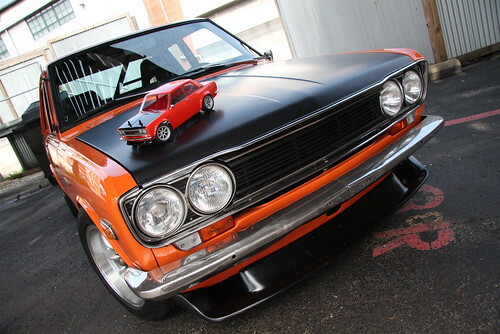 Not sure how to word this, but... why is your little Hotwheels Datsun 510 not sitting on the hood of your HPI cup car in that photo?!? Or was that yenpit's dinky car? Anyhow, I await the dyno results.